OPEG is dedicated to providing educational experiences for our members and Evaluators throughout the region. We hold three scheduled conferences each year. The Spring Exchange highlights a keynote speaker on a current topic of interest in evaluation, opportunities for OPEG members to share their evaluation work, the election of new Board members, and presentation of awards for contribution to both the field of evaluation and for service to OPEG. Check the event calendar to find out the year's theme and any particular year's criteria. Members are encouraged to submit abstracts for review. The Fall Workshop features invited presenters to provide methodology, techniques, and technology to help evaluators improve skills and keep up with changes in evaluation practice. The Summer Stats Series provides training in specific statistical methods in an intense, limited capacity setting.The Summer Stats program provides free advanced statistics training opportunities and is open for members only. See our Upcoming events listing below. We are happy to share events from all over the region that may be of interest to our members. Please let OPEG Administraive Coordinator Barbara Krannich know about any upcoming events you would like to list. Would you like to attend our Spring Exchange but need to get your employer to agree? Download a copy of our letter explaining why attending will benefit both you and your employer! Organizations that require an updated W9 form for payment may download one here. 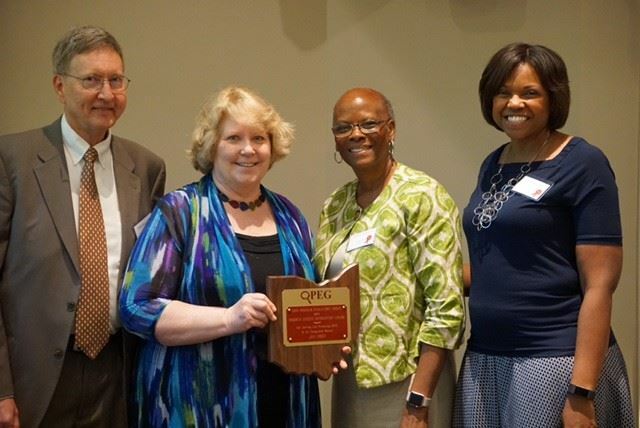 The OPEG Board wishes to thank everyone that attended the 2018 Spring Exchange in May. OPEG Member Jan Noga receives the Evaluation Recognition Award. Our keynote speaker was James W. Altschuld, Professor Emeritus of Education Studies at the Ohio State University and former OPEG president. AEA President Leslie Goodyear welcomes everyone to the Exchange. OPEG reserves the right to edit or refuse submissions.